For best-men looking for a ski resort that can offer quality skiing and amazing nightlife, then booking a Borovets stag weekend will tick all the right boxes. Not only is Bulgaria half the price of Austria & France but snow conditions have consistently been top notch! Having hosted the World Cup skiing championships twice, pistes are designed for all levels of ability. With fewer people on the slopes in comparison to France, you’ll be able to cover more ground and enjoy more runs. The apres ski nightlife in Borovets is widely known as some of the wildest in Europe and still at knock down prices. It really is a cheap ski stag option; its almost purpose built for a ski stag weekend. This superb Bulgarian ski resort, is also extremely convenient to reach. With a short transfer time of only 1 hour 15 mins from Sofia airport, it means more time for fun & good times! A very good ski stag weekend in Bulgaria! That sums it up, nothing more needs to be said really. Anything you can think of was there for a ski stag do, and the communication was top notch. Thanks for organising an unforgettable ski stag break! Borovets was just like you said – good skiing, cheap as chips, cracking nightlife, low cost flights and short transfers. Spot on. I couldn’t say what the best part of this trip was; the actual holiday or the smooth experience we had with your company. We booked our flights, packed our own bags and drank our own beer; everything else was handled excellently by your team. The nightlife was very lively and perfect for a stag weekend, prices were reasonable as well which helped! The hotel was superb and in a great location. Our driver was always punctual and kept us in the spirits of the weekend. All of your staff were always well-informed and we felt in good hands throughout the trip. Thanks once again for absolutely nailing every part of the trip. If anybody asks for recommendations for stag do ideas, I know what I will be suggesting. Hi Guys – thanks for sorting out our ski stag do in Borovets – we are just about recovered. It was epic! Great snow, great skiing, great acres-nightlife and simply great times! Two of my close friends have used your stag skiing services and praised your attention to detail and personal service, I’m very happy to say they were right to be so positive. I rarely write back to companies to say thanks, but considering you’ve just organised one of the best weekends of my life, I really wanted you to share my joy. Thanks for suggesting Borovets stag weekends and going down the low cost airline way, you basically saved us a lot of money and got a lot more of my friends on board for the trip. It was an amazing stag do, your local Bulgarian team are really good people, the ski guides were brilliant with us and in reflection I can’t believe we did so many things and stayed in such a nice hotel for the package price we paid. If I speak to anybody about stag nights, stag weekends and the likes, I will put them onto stagmania. Please share your highlights: Hotel fitted the bill, Brett helped organise a few last minute changes to times etc and he helped seamlessly. Hotel was right by the slopes and the bars were brilliant. Great weekend had by all. Very good weekend. Everyone was happy with it and the fact you walked down stairs to get your ski equipment and walk across the road to the gondola was ideal. Everybody has said they would be happy to do it again and book through stagmania ski team. Mate, that was probably the best 3 days of my life. Bulgaria was unbelievable, better than you described, I just can’t believe that more people haven’t clocked onto how cool (pun not intended) it is out there. Yes, the clubs are a bit cheesy, but they are packed with fit locals, the bars were filled out every night with the ski apres socialites and the general atmosphere in the resort was buzzing. Not a cosmopolitan place but I would recommend to anybody and not just stag dos, to try out the ski and nightlife in Borovets. Cheers for all the hard work & the general success of the ski stag do. Hi guys, We have now arrived back home from our stag weekend away in Borovets, Just wanted to say a huge thanks to you and your local staff. We had an awesome time and everything went without any glitches. I will definitely be recommending stagmania to others in the future for sure. Cheers for all your stag-support and advice throughout the process. Great job Russ. All the best and perhaps we will speak again in the future. Russell was brilliant at getting everything sorted and reminding me when I needed to get the guys sorted, it was easy once we got there as George (the local staff) stood with a sign and took us straight for the minibus transfers and drop off outside the hotel. George oversaw the whole check-in, distributed our ski equipment and lift passes and even bought the first round of beers. I would highly recommend a ski stag holiday, its a bit different than the typical lads trips i’ve been on before. The snowboarding and skiing kept the guys busy in the daytime, and roaming around the resort at night was easy and cheap n cheerful. I liked the fact, that there are no dress codes or long entries for clubs. People were very friendly, plenty of hen dos to mix in with, and many 2 4 1 drink promotions. So no complaints for choosing Borovets stag weekends as my destination of choice for my group of friends. Faultless. From start to finish, Brett made me feel like I was his only client, answer all my questions promptly and overall, organising the perfect ski stag weekend. Expectations were managed well, local tips and advice given from personal experience and we felt in safe hands throughout. Documentation was also faultless, leaving us all completely aware of what we needed to take etc. On the ground, Boris our coach guide and airport rep was great, on time and really friendly, informative and helpful. The hotel was all we needed, and as Brett explained the food was never going to be like the French alps but its was fine and we ate out every evening. The hotel location was perfect near to the ski lifts and bars. Skiing was surprisingly good – as good or better than Morzine in France last year, and beer is cheap, locals were friendly. Ideal for a short ski stag weekend! Was a fantastic time on the ski stag do mate, thank you for all your help really appreciate it. I would grade the weekend as 9/10. Borovets is a great place to find some great snow, and even better apres action. We definitely enjoyed the nightlife there, very boozy evenings. The skiing was much better than expected, hardly any queues for the lifts and lots of good runs. I would consider coming back for a lads ski trip. Perfect stga ski trip. The overall feeling from my friends, was that it was the best stab yet we’ve done. Excellent snow, cheap beer, fun skiing, friendly locals. Bulgaria is defo worth the extra effort, rather than a stag do in the UK. Quality times Russell, Borovets is a cheap and cheeky number. Fit girls & cheap drinks were enjoyed all week.. brilliant strip action – and the skiing conditions spot on. Thank you for your email Brett, we had a delightful time in Borovets. The standard of accommodation was very high and it was fantastically located, exactly what we had requested. The evenings as you can imagine were alcohol induced and a bit of a blur, but in a way I’m glad I can’t remember everything I did. The days were more about recovery than skiing, but I’m glad to say, we did make an effort on the slopes. Bulgaria is very beautiful and like most Eastern European countries so are the ladies, who were a big hit with the guys. We met a lot of people out there, some locals, some expats, so we got to know the night scene very well and I’ve jotted a few cool bars for you to review on your website. My younger brother Sohan is best man for a wedding next year and I passed your details to him about a ski stag do to Slovenia, I hope you can sort him out as good a time as we had. Thanks again mate. Borovets ‘loving it’. The girls are definitely hot and the nightlife in the resort is fire. I can whole heartily recommend Bulgaria for the ultimate stag nights experience. Book your easy jet flights, contact Stagmania and get ya’self into the thick of it….i figure this answers your question, whether I had a good time!?! Take care. Another trip later this year! It was an absolute pleasure experiencing your ski stag weekends, the booking process was very easy and it saved a lot of hassle and a lot of stress. Having you guys organise everything took the pressure off myself and it made my trip a lot more pleasurable. Bulgaria was a great place for a stag send off. The majority of the group are talking about doing another trip later this year and I’ll be happy for you guys to quote another ski package for us. So why choose Borovets for a ski stag weekend? 1) Skiing for ALL abilities. Not all resorts can genuinely say this but Borovets can definitely cater for all levels of skiers. Beginners can book ski school or private lessons at extremely affordable prices while advanced skiers and boarders will find more than enough piste for a short ski break. 2) Night-life. Borovets boasts a plethora of bars, pubs, restaurants & clubs to suit all tastes & preferences. From cheesy karaoke bars to panoramic sky bars and from strip clubs to cutting edge house clubs it really does have it all. 3) Exceptional Value. Borovets will not alienate anyone – it is still the cheapest ski resort in Europe. Each year we go back expecting prices to increase but we are always gratefully surprised to see the exceptional drinks promotions are still an in grained part of the Borovets apres ski culture. 4) Short transfer time. From Sofia international airport to Borovets ski resort it is only 1 hour 15 mins in a mini-coach; making it ideal for a ski stag weekend. 5) Flights from the UK. You can fly to Sofia from: Bristol, Gatwick, Birmingham, Luton, Manchester, Heathrow, Liverpool and Stansted. Places to avoid – Sorry to say Rico Tico is probably the worst ‘Mexican’ themed restaurant we have ever tried. Best looking Barmaids – BJ’s is still one of our favourite night spots in Borovets. Great music playlists & Katya who has worked here for over 5 seasons is still the nicest and hottest bar lady in Boroverts. Borovets is a 10/10 choice for a ski stag weekend in Europe. The skiing is great and accessible for ALL abilities. The nightlife is epic & prices are still ridiculously good value. The flights are cheap & the resort transfers are short. PLEASE BOOK YOUR OWN FLIGHTS. Our Ljubljana ski stag weekends packages are still the best value. The Slovene capital has a chic & seductive nightlife, within an exquisite old town. The ski stag holiday action is fantastic with a long season of snowfall, so our stags can try snowboarding, ski bikes & night sledging. 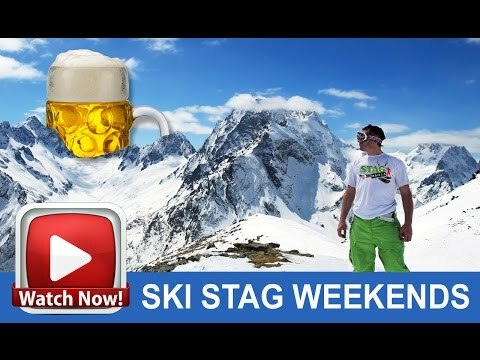 We highly recommend Slovenia ski stag weekends.